I believe that holidays are magical and a great time to INDULGE!! I have been eating very clean for the last few weeks, including eating little to no gluten. Last night I indulged and celebrated a Dr’s trip that involved a good bp, good news about some pain AND confirmation that Mr McDorkins had lost 17lbs in the last month!! Whaaaa?!?!? You have to celebrate that!! If you have a Flippers around you and have been questioning the delicious factor, I can confirm, they are amazing. We have sucky pizza all around us and they’re like a diamond in the rough. 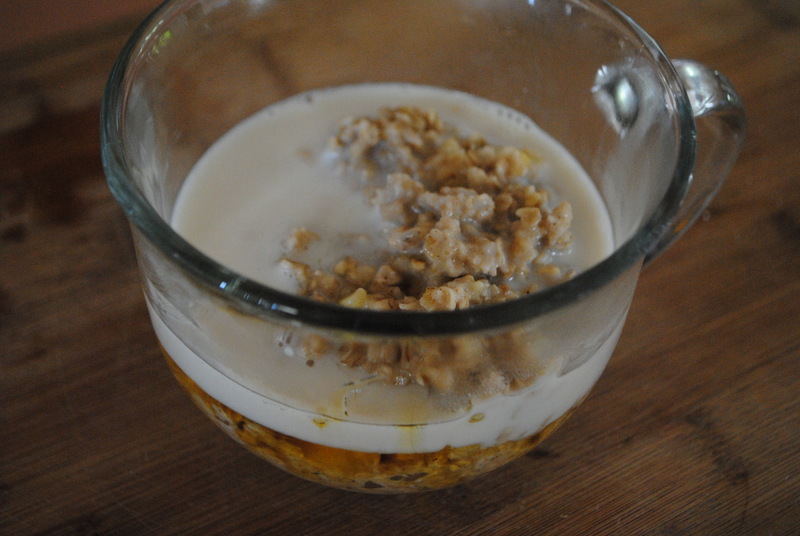 Yesterday’s breakfast, apple cinnamon oatmeal with treacle…You can see the delicious golden syrup under the milk. Super easy and from scratch. Seriously, there is no reason to use instant oatmeal when you can make your own in the same amount of time. 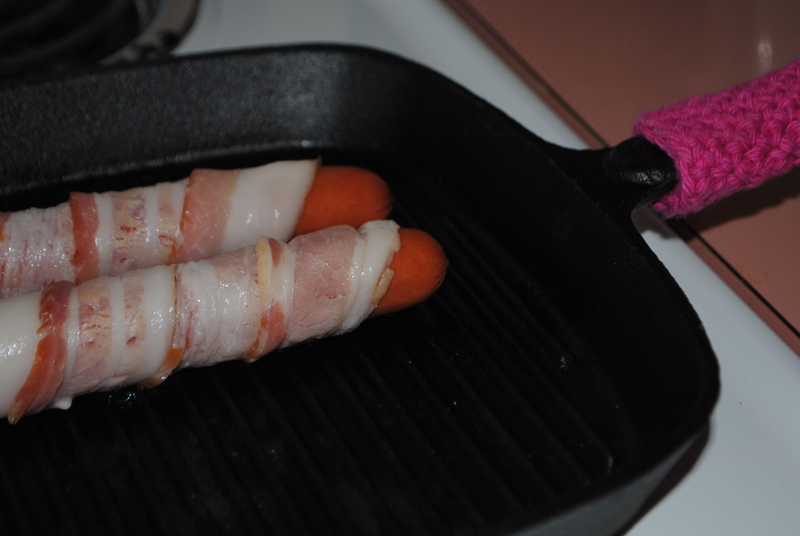 Today, my holiday celebration, though the hubs is staying away from this particular treat, is bacon wrapped hot dogs. Nitrate free across the board. Sodium is higher than I usually get, but I’m the one with low bp. It needs a good kick start now and again. 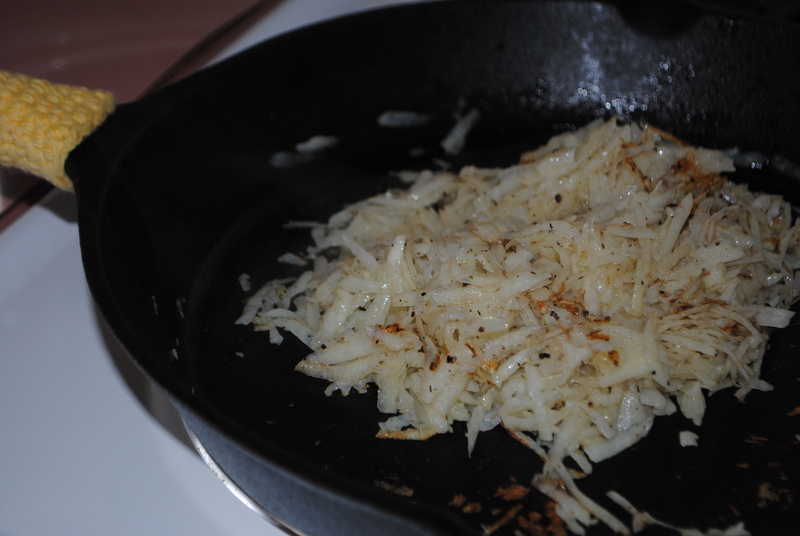 For our side, I made a hash by shredding potatoes and tossing in olive oil, black pepper and a yummy mixture of herbs called ‘everything but salt’ that I picked up at my local co-op. Yes, I am an absolute nerd and I crocheted little handles for my cast iron pans cause I loves them hard. Ha! Set your burner to medium high heat. Toss the apple pieces with the cinnamon/apple pie spice and throw it into the pot and add the 1 1/4 c milk. Once it comes to a simmer, add your oats and take your spoonful of pb and slowly stir it in, until it melts off of the spoon. Turn the heat down and cover to cook, mixing often. This particular ration will make a very thick oatmeal, because I love to add milk when it is done to help cool it off faster. Simple and only takes a few minutes. From there, Scoop out your servings and then sprinkle or spoon your sweetener of choice on top and add the additional almond milk. It gives it a more dramatic appearance if you don’t stir it before serving. The peanut butter gives it a nice protein factor and helps kept you full longer. 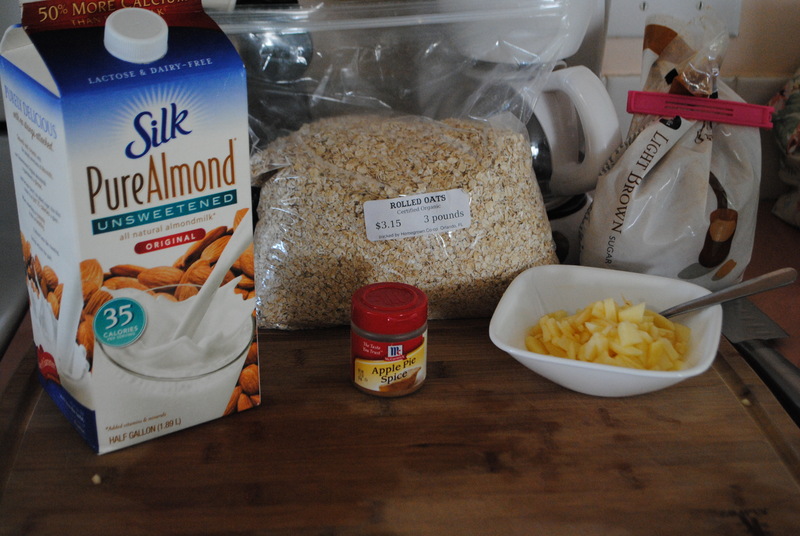 You can alternate any type of ‘milk’ or use real milk or even cream in this recipe. You can use whatever sweetener you have on hand, white sugar, turbinado, brown sugar, agave nectar, honey, treacle, etc. I think a good oatmeal is all about personalization. This entry was posted in Food and tagged apple, bacon, cinnamon, eat, food, fourth of july, hash browns, holiday, hot dogs, oatmeal, potatoes, treacle, treats by themcdorkins. Bookmark the permalink.